Today we got a giant new couch delivered and I spent much of the day organizing and rearranging the apartment to accommodate its bulk. Okay, it doesn't look that big in the picture. Let me assure you that you could easily sleep two people on this couch. I'm sure most people reading this own a large house where they have one of those massive L-shaped couches that wrap the entire outside of their living room and have to communicate with others on the couch via walkie-talkie. If you are one of those people then just go easy on us. 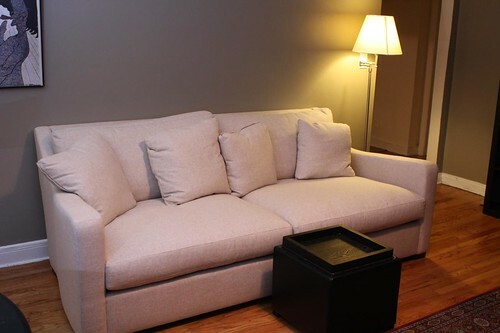 Allow us to think that this humble couch is excessively large and that we are living a decadent life similar to that of Roman nobility before the fall. Since I was so busy, and feeling kind of queasy all day, I turned to the pantry where I found this quinoa blend from Wholesome Kitchen in Flushing, NY. It consisted of quinoa, dried potatoes, dried onion, dried Persian lemon, dried dill, dried parsley, dried cilantro, dried garlic, red chili flakes, and nigella seeds. I don't know what nigella seeds are but I do know that this looked like a quick and tasty way to make a dinner that Jen would like and would also soothe my stomach. Jen enjoys any dinner made with small globe-shaped grains. It's a fact. 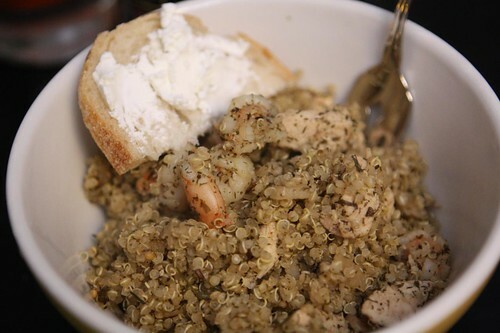 Couscous, quinoa, you name it and she's all in. For drink I felt like having a beer. Sometimes, when my stomach is upset, I often crave a small amount of beer to help settle it. I'm not sure if this is just my normal craving for beer telling me to stop my complaining or if it actually does have some sort of restorative property to it. At any rate something in the beer tends to settle my stomach. Maybe it's the bubbles, maybe it's the alcohol, maybe it's my general desire to have some beer for any reason whatsoever. 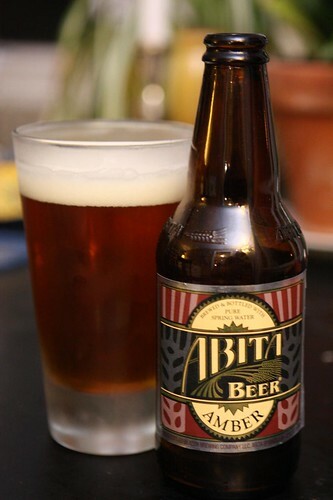 I picked this Amber from Abita only to find out that they're having a Boudin & Beer celebration on November 11, 2011. I'm wondering if it's too late for me and my dad to get tickets to go check it out. Odds are it's not. Also, I should probably wait until I'm done with my stomach ache to partake in boudin.